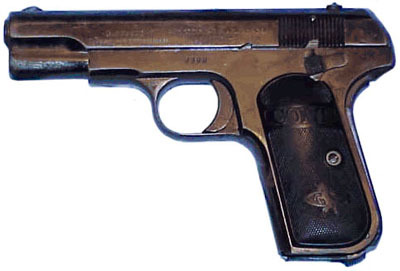 Model M in .380 ACP caliber serial no 9398 - The back strap is engraved "LPD No.77". The previous owner attributes the inscription to the Lorain, Ohio Police Department, however, the two shipments suggest that the destination of these guns was somewhere near Boston, Massachusetts. There were two shipments totaling 100 guns in this contract. One shipment of 50 went to Iver Johnson Sporting Goods and the other shipment of 50 went to William Read and Sons.